VPS hosting is a very common type of hosting among many customers. It basically takes a big server and makes partitions of many small servers. These small servers run its own operating system and neighbors cannot access it. A virtual server is like a bridge between shared and dedicated hosting. There are several benefits of VPS hosting like being cost-effective, it is powered by highly advanced technologies, user-friendly base, etc. VPS is a perfect solution for businesses which are small and do not have the budget for dedicated servers. Once you have chosen VPS server for your business, the next step is to figure out how much control you would want over your VPS server. Therefore, for this, you have to decide between Managed and Unmanaged VPS plan. Managed VPS means when your hosting provider is looking after your server and monitoring its performance. Managed VPS is usually for people who are not technically savvy. This is the only solution when you have little or no experience of maintaining a server. The host sometimes pro-actively takes care of all the technical aspects of your website like installing software, server configuration, security, etc. • The speed of Managed VPS is highly vigorous, therefore with managed VPS, you can guarantee little or no downtime. • Technical support is always available 24x7. If any problem persists, you can call the support team and can get things solved easily. • You can invest more time in your business rather than maintaining your server maintenance, security, configuration, software update, etc. because it is all managed by the hosting provider. • There is no worry about security since it is ensured by monitored firewalls, investigations of distrustful traffic and vulnerability frauds. • Without shutting down or rebooting you can change the size of your hard drive or even create a new one for that matter. • You can have unlimited resources such as RAM or CPU to run really fast and level of scalability is really high. Unmanaged VPS means when you will have less support from your server. You have to take care of your server and monitor the performance. Unmanaged VPS is usually for people who are really good at technical things. If you choose Unmanaged VPS you may need to know about software updates, DNS configurations, control panel set up, server backup, etc. • They are generally cheaper than Managed VPS because the hosting provider gives less support and you have to manage your own website. Therefore, they charge lesser compared to Managed VPS. • You have full remote access to your server and self-management rights. • Your information is safe since no one can access it except you. • You can use resources according to your needs. Comparatively, both the plans are good and have their own advantages. 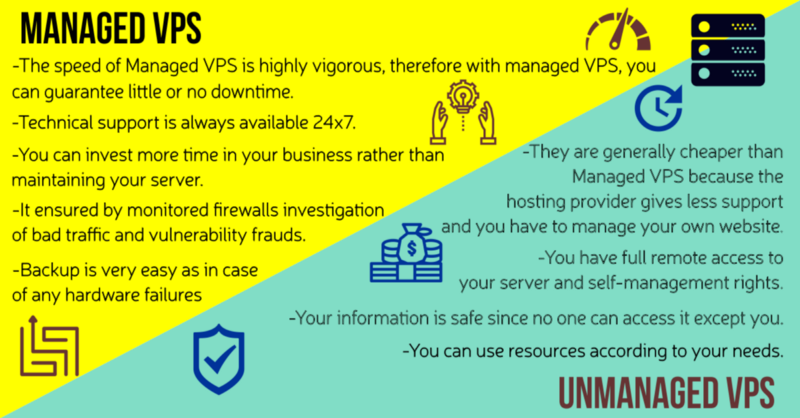 Unmanaged is financially economical than managed VPS and you have full control over your server, whereas, in managed VPS the hosting provider helps you with technical things. Before choosing between the two ask yourself questions like, do you have enough budget? Do you have the technical knowledge to manage your server? If you get the answers to these two questions, then your answer should be clear enough to decide which to choose. Well, it all depends on your business requirements and what you need.